Allow me to introduce you to Duke Grabowski, mighty pirate. He's a lunkheaded, musclebound mouth-breather who used Int as his dump stat, and prefers punching to talking his way out of problems. He's also the protagonist in his own game, a throwback tribute to the Monkey Island series that's available on Steam right now. So, who here likes Monkey Island games? I know I do. I have a framed, signed print of Steve Purcell's artwork from Tales of Monkey Island displayed prominently in my home. I've played through every game in the series multiple times, and I often find myself quoting memorable lines (That's the second-biggest Q-tip I've ever seen!). I've always loved the implication that the hero, Guybrush Threepwood didn't seem to be really good at what he was doing, but prevailed through persistence and a willingness to try anything to get closer to his goal. I wasn't really aware of Lucasarts games until the third installment, The Curse of Monkey Island. That was a great game to start with, though, containing full voice acting, gorgeous hand-drawn animation, and a long, involved quest with scalable difficulty (basically, adding extra steps to some of the puzzles). There's no doubt in my mind that Curse was one of the finest adventure games ever made, and should be held up along with other Lucasarts games like Sam and Max hit the Road and Day of the Tentacle when talking about the adventure genre's glory days. After playing through Curse, I tracked down copies of the earlier games in the series, and happily bought them when they were remastered. I also bought and enjoyed playing through the later games in the series, though I thought Escape From Monkey Island was hurt somewhat by its transition to 3D. Eventually, Telltale got the rights to do an episodic Monkey Island series, but that's the last we've heard from the franchise since it wrapped up in 2009. A little while ago, I got a private message here on the site from somebody affiliated with Venture Moon Industries, the team behind Duke Grabowski, Mighty Swashbuckler. They'd seen my writeup on Thimbleweed Park, an upcoming game based on Maniac Mansion and Day of the Tentacle from The Secret of Monkey Island's director, Ron Gilbert. They invited me to try out their game, since it seemed like I was a fan of Lucasarts-style adventures. 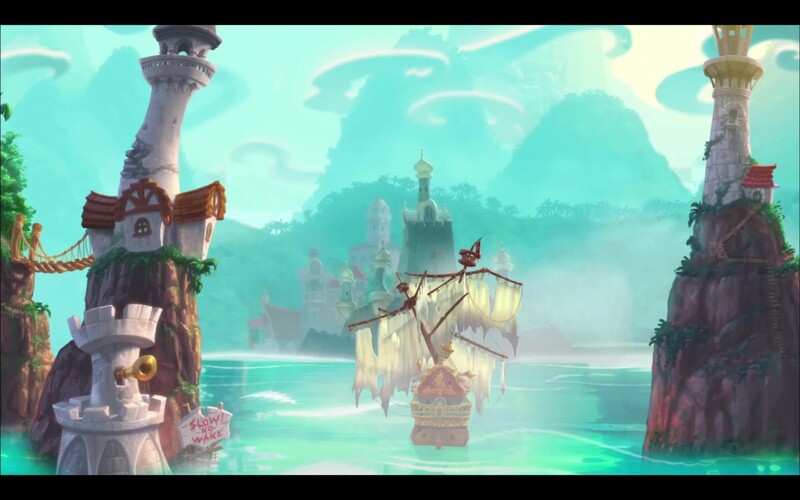 Duke is heavily inspired by the Monkey Island series, and even has Bill Tiller on staff, who helped make Curse of Monkey Island when he worked at Lucasarts. 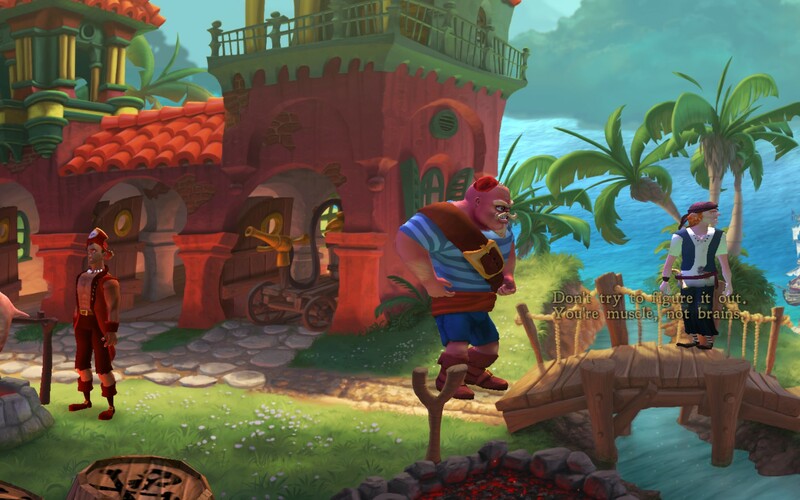 Duke Grabowski is a loving tribute to the latter Monkey Island games, and wears its influence on its sleeve. 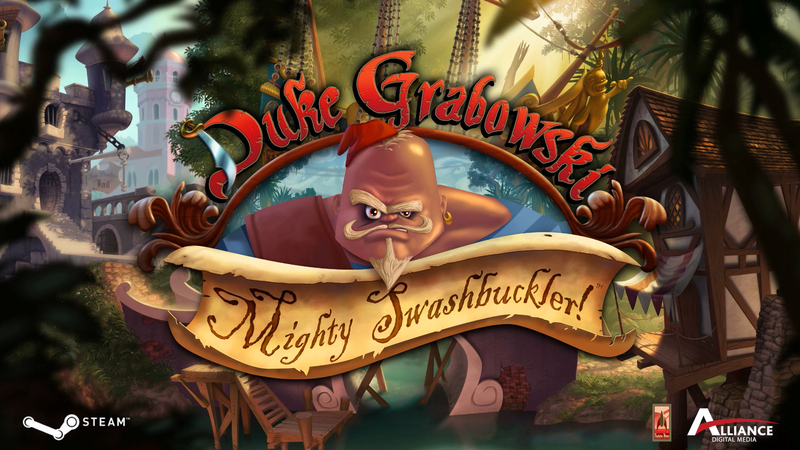 It may sound a little unfair to compare Duke Grabowski to the Monkey Island series, but as you can probably tell from my earlier statements, I mean it as a compliment. Duke's visuals are lush and colorful, and the Caribbean-flavored music is spot-on. What's more, every interaction Duke has with his environment triggers a unique voice line, and the acting is well above average. One thing I appreciate is that it's not possible to get yourself into a failure state, something I particularly enjoyed about Lucasarts' offerings. It's easy to imagine Duke having a parallel adventure somewhere close to Guybrush, neither crossing the other's path. 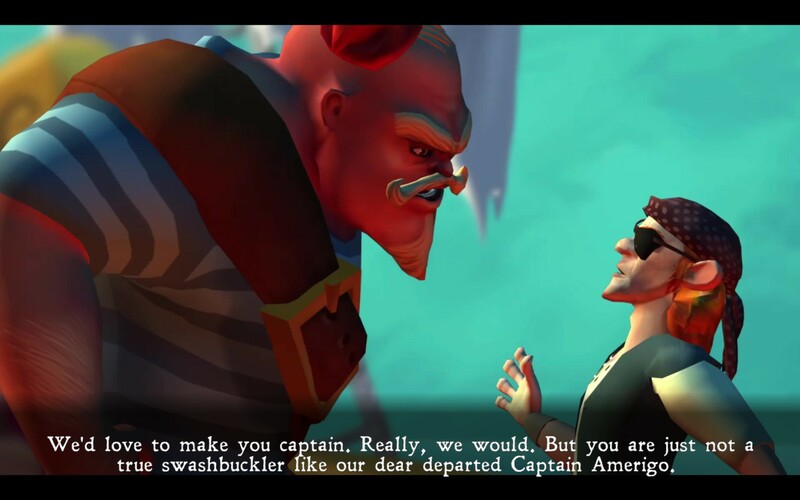 Duke's story sees him vying to become the captain of his ship after his former captain has expired. His fellow pirates don't really respect him, but he tends to get violent when he doesn't get his way. So one of the other crewmen, a pirate called Slew Face, tells him that to become their leader, he should demonstrate his ability to woo some ladies, as their former captain had something of a reputation as a Don Juan. Really, all he's doing is getting Duke to leave the others alone for a while, but Duke's not especially gifted in the brains department, so he takes Slew Face at his word. Duke can move around his environment and interact with anything he sees. The three possible interactions with every object are context sensitive, and Duke can use his eyes, mouth, or hands when he wants to do something. Usually he'll just look, talk to, or interact with an object, but occasionally the mouth icon can mean he tries to eat or lick an object, or the hands icon will indicate you want to punch something. It's a clever way of presenting interactions, and sets up some funny scenes. While Guybrush is punier than your average pirate, he's usually the smartest guy in whatever room he enters. As I mentioned above, Duke is quite the opposite, so he has a different approach to the pirate themed puzzles he encounters. As an example, in one puzzle Duke needs to get past a group of zombie pirates who are well stocked with cannons and cannonballs. While Guybrush might disguise himself as a woodland creature or find an alternate path, Duke's solution is to rip a tree out of the ground and use it as a bat to knock the cannonballs back at the enemy's position. Not all of the puzzles can be solved with brawn, however, and for those that require a more subtle touch, Duke can ask for help from one of his companion characters. 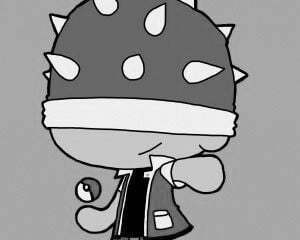 When they join him, their special skill will be added to Duke's inventory, and he can "use" them to help with puzzles, sort of like how Sam used Max as an item in Hit the Road. The game does have a few issues. The text shadows sometimes don't line up with the text, so a strange ghosting effect shows up under some of the dialogue lines. There isn't support for cloud saves, so if you move from one computer to another, you'll have to start the game over. There's a little less polish than you might expect if you've played Monkey Island games, but that's forgivable considering the ambition of the project and the size of the team that's made it. Adjust your expectations going in, and you should be fine. I enjoyed my time with Duke Grabowski, even though he's initially sort of hard to like as a character. I found that the more I played, the more he grew on me. I think I might know where his last name came from, and that was a nice touch. The team said that they'd like to make more games in the series, provided the first does well. It's available on Steam right now, so if you're interested in a new Monkey Island game, this is as close as you can get for the time being.